See the best South America has to offer, with 4 and 5 star quality escorted and custom personalized tours and low-priced plane tickets to South America! 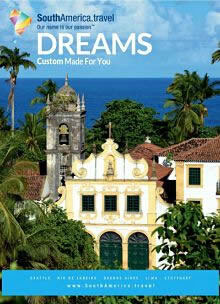 Enjoy luxury travel to South America. Combine their discount airline tickets with Argentina, Brazil, Patagonia, or Peruvian escorted tours or independent vacation packages. Or book your own hotels, and just let SouthAmerica.travel help you find cheap airline tickets to South America, as well as affordable South America flights between countries. Whether you're booking plane tickets to South America, looking for affordable but luxurious Argentina or Brazil travel deals, or shopping for the exotic adventure trip of a lifetime, SouthAmerica.travel has the flights, packages and first class travel tips to make your visit memorable.